I remember distinctly my first monster cookie. It wasn’t that long ago and a friend of mine introduced me to the yummy homemade goodness of a monster cookie. 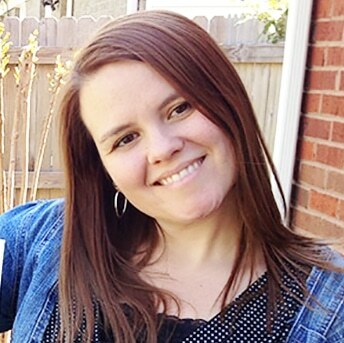 Our family has been fans since that day and I wanted a way to enjoy them even more in the summertime. Ice cream is always best when enjoyed with the family! 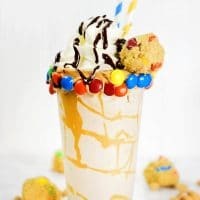 Monster Cookie Mash Shake with Monster Cookie dough is a great way to enjoy yummy monster cookies in the summer. 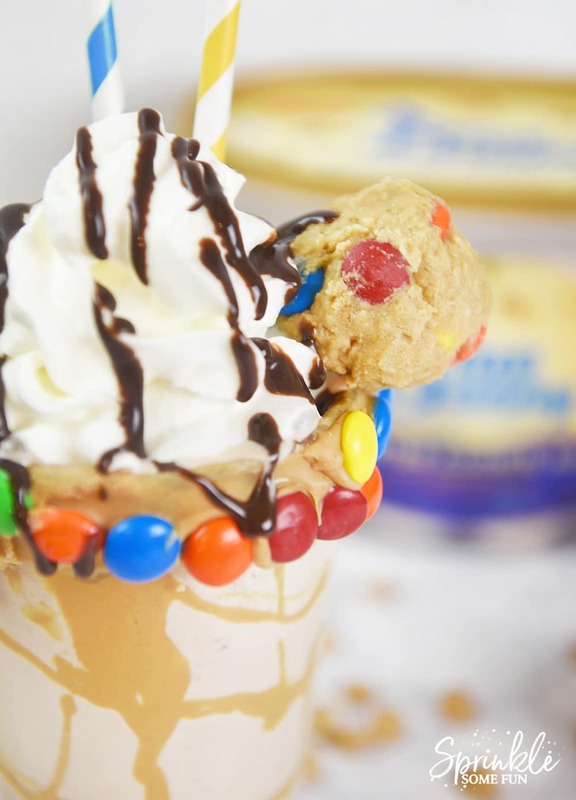 We make these easily with Blue Bunny® Monster Cookie Mash Ice Cream! 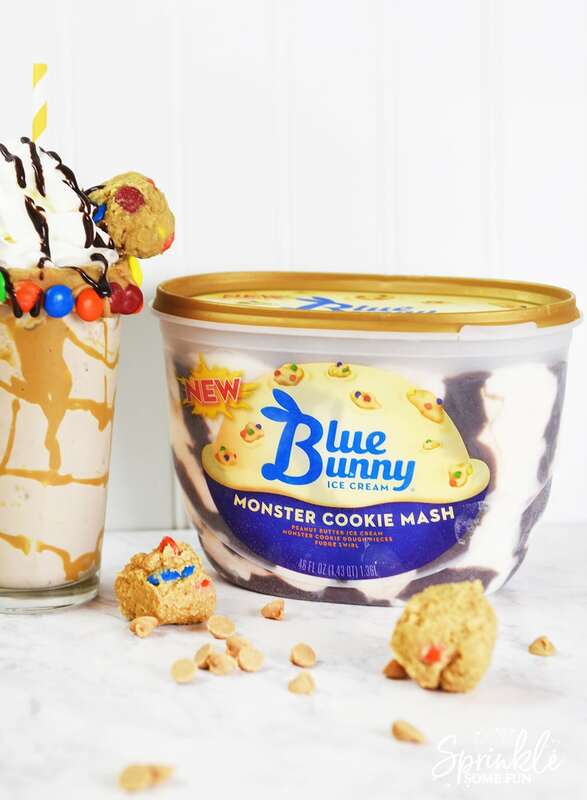 Blue Bunny® Monster Cookie Mash Ice Cream combines monster cookie dough pieces, yummy peanut butter ice cream and fudge swirls. I really love those cookie dough pieces and they include plenty of it! This is important when you have 7 people in the family that all want ice cream! Ice cream and frozen treats are always a welcome treat in the summer. When the kids get outside playing, they enjoy coming inside for a cold treat. 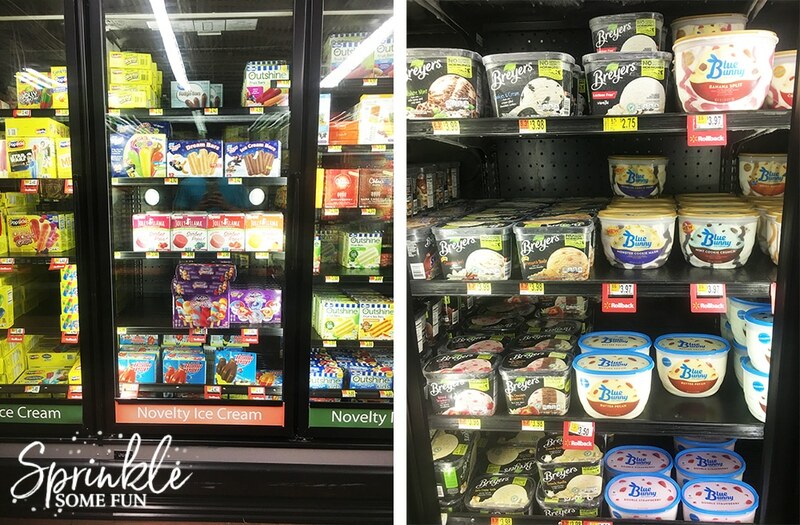 They especially love The Original Bomb Pop® and Blue Bunny® Ice Cream which we get at Walmart in the frozen foods section. 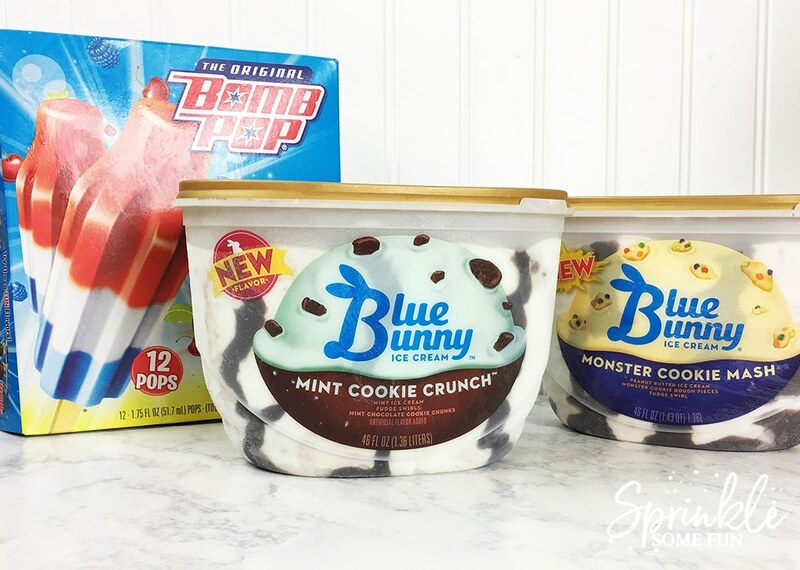 I can always count on Blue Bunny® to have fun and unique twists on ice cream flavors! To add a little pizzaz to our shakes… I used peanut butter on the inside of the cups before pouring out the shake into them. I also added a rim of candy made with peanut butter chips I melted and then dipped the rim with it. Then I placed chocolate candies on top! So cute and tasty. 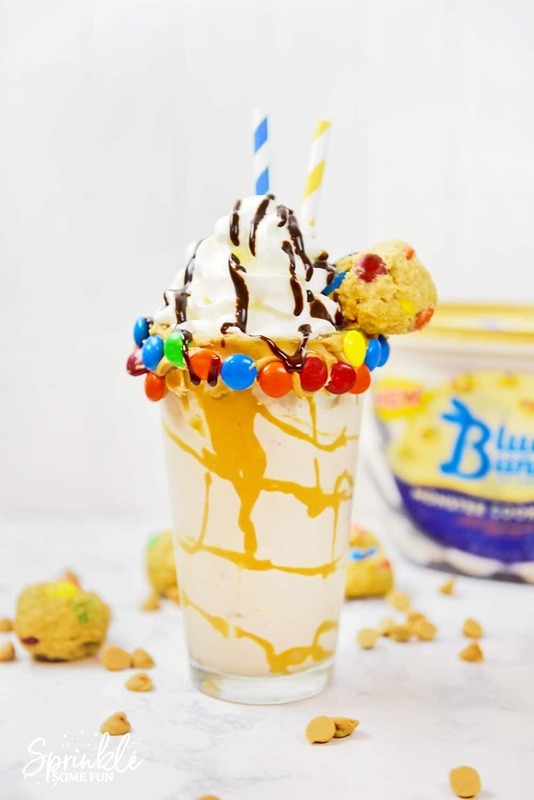 Lastly, I added a fun topping with monster cookie dough balls! These are easy to make and use with the shakes. 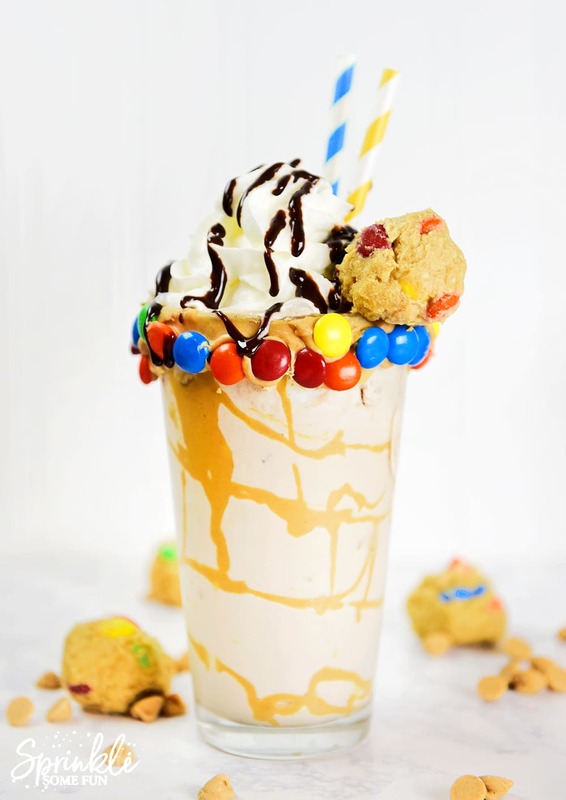 Add a little whipped cream and chocolate sauce and it’s a monster cookie mash shake masterpiece! Make cookie dough balls first by mixing cookie dough ingredients into a small bowl. Roll into balls and refrigerate for an hour. For the shakes: Blend the Ice Cream and Milk in a blender. Add peanut butter to a glass cup with a piping bag on the inside of the cup. you can make this into a fun design if you wish. Add the blended ice cream shake into the cup. Add a cookie dough ball if you want and other toppings. Add a straw and enjoy! What kind of summer treats do your kids love to eat? This summer The Original Bomb Pop® is pairing up with Snapchat to create a custom lens. Users hold up their camera phone while in the app and watch as their face transforms into a Bomb Pop and blasts off across the sky! On National Bomb Pop Day (June 29th) the lens will be available to Snapchat users nationwide. 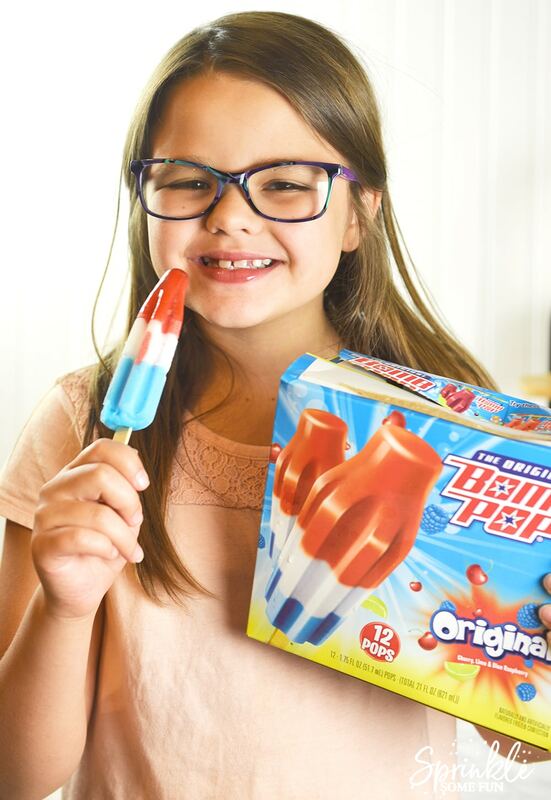 I know my kids can’t wait to play with snapchat that day because they are big fans of The Original Bomb Pop®!